Mornings around our farm house can be a whirlwind of activity trying to get breakfast served and four kids ready and out the door. When mornings get chaotic, most of us parents and farmers find time for a cup of coffee before pulling on our boots, grabbing our gloves and heading out the door for morning chores. The coffee filter used to make the morning pot of coffee reminds me of the grass filter strips we have in our farm fields. Much like the coffee filters keep the grounds out of the coffee, these grass buffer strips act as barriers that keep soil in place and filter out nutrients before they reach our ditches, creeks and waterways. We seed these areas with a variety of grasses and work to maintain them so they remain effective year after year. 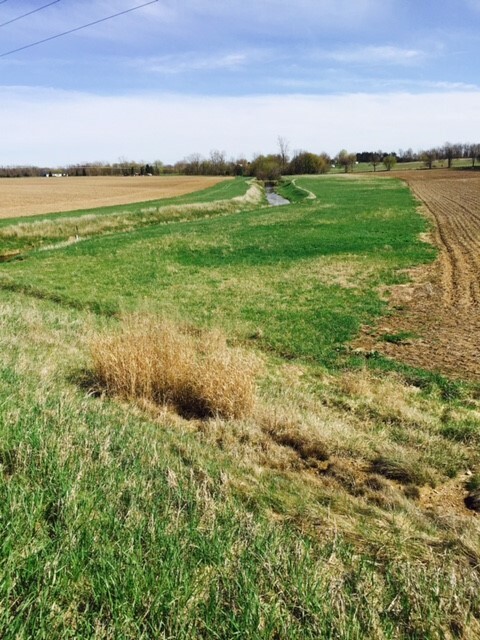 Caption: Grass filter strips along a waterway on Carla Schultz’s Michigan farm. This is especially important when we have heavy rain or melting snow. The other day we got an inch of rain in 10 minutes. As the rain poured down, the root systems of the grass filter strips helped prevent soil erosion, filtered out nutrients and protectants, and protected our water downstream. This conservation practice is important for our farm and our community. It keeps our farm productive by retaining our valuable soil and nutrients and protects the water that we rely on for our families and our animals. These filter strips are just one way we are working to successfully grow our crops while protecting the water and soil around us. If you want to learn about other sustainable farming practices or hear from other farmers, grab a cup of coffee and visit us on the CommonGround website or my family farm Facebook page. We’d love to hear from you in the comments and answer any questions you may have. This is great. I have recently seen many crop farmers taking out all the fence rows and buffer areas to the ditches, to farm as much area as they can … I wondered if that little extra money will make a big difference or harm the local waterways and drink well water.